Avoiding the flu: I woke up on Saturday achy and nauseous, convinced I had caught the scary flu that’s going around. Thankfully, it was just a 24-hour bug but since I couldn’t keep anything down, I made Rob run out for Coca-Cola. It’s been my go-to stomach-soother since the time I got food poisoning on an overnight flight to London and a sympathetic flight attendant convinced me to try it. Rob actually found Mexican Coke, which may or may not be a made-up thing but did the trick. Showing love via carbohydrates: While breakfast in bed seems like the ultimate thoughtful gesture, the potential for crumbs-in-sheets and coffee spillage is high. 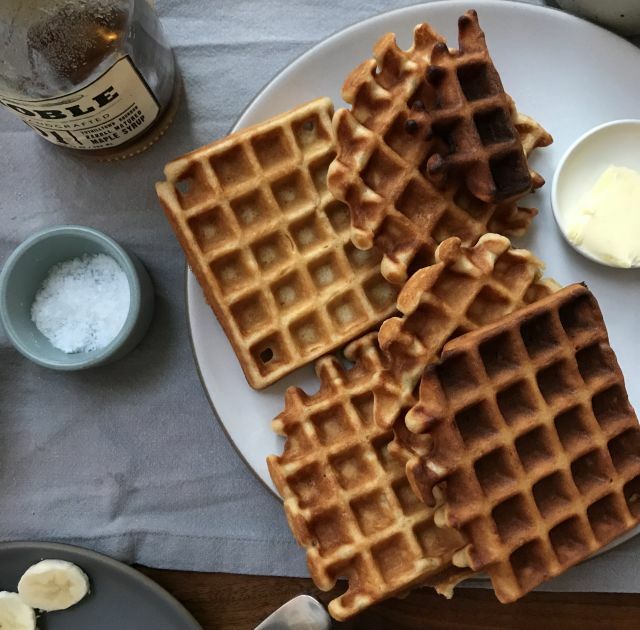 So how about making a pile of golden-brown waffles and serving them at the table instead? Rob made these for me on Sunday to celebrate my recovery and even subbed in whole wheat flour because, love. Bonus: We froze a couple for Lilly to teethe on! Discovering a better red: I switched over to nontoxic nail polish when I was pregnant and haven’t gone back. This weekend, I introduced nail aficionado Rachel to my new favorite neighborhood salon, which stocks a huge range of healthy polishes, including RMS Beauty. Their 6-free formula is extra opaque and shiny; I got a cheery tomato shade called Killer Red. Page-turning: I finally picked up Celeste Ng’s Little Fires Everywhere and was hooked from the first chapter. It’s my favorite kind of fiction: smart, interesting characters, excellent writing, and a zippy plot. Like healthy candy. Going full athleisure: I used to be religious about morning workouts but now I spend that time with Rob and Lilly. Instead, I cram in workouts during the day, which often means running around in head-to-toe Outdoor Voices getup. I have other gear that’s more high performance but OV is the only thing I can pair with a cozy sweater and sneaks and feel put together. Faves: If you’re a shorty like me (5’3), the 7/8 legging is the perfect length; the light racerback tank is a great basic and layers really well (size down! ); and the hoodie is the softest thing I own. Sending candlegrams: If I had told you in time, Otherland would have been the perfect V-Day gift for basically anyone in your life. Whoops! But you should know about this new candle company anyway. Hayley—who else—introduced me to them and I’ve already gifted four! They have five scents and you can customize the packaging with different matchboxes and prints. They also feel way more expensive than they are ($36 including shipping) and arrive lickety split. Pro weeknight cooking tip: Lynn, who is a food editor and mom of two young kids, makes healthyish dinner almost every night in under 40 minutes. In addition to having go-to staples, her secret is a dinner log. “I’ve been keeping it for almost 5 years and it’s a lifesaver when I’m stumped. It helps ensure that great recipes aren’t forgotten and reminds me that whenever I make fish cakes I should make more than I think I need because my family will eat them all.” So smart! Must-have baking book: Caitlin over at Love Stories TV is a fellow cookie monster and reminded me that I’ve been totally remiss in not mentioning Bravetart by Serious Eats pastry expert Stella Parks. As Caitlin says, “The recipes are her take on iconic American desserts, everything from Oreos and animal crackers to apple pie. It’s also filled with legitimately interesting stories of how our favorite desserts came to be and really thoughtful insight on ingredients/tools that make baking a million times less frustrating. IT’S SO GOOD.” Agree, and thanks for the nudge to crack open my copy and get to baking. Finally, two things that are making me happy, from opposite ends of the spectrum: the inspiring official portraits of Barack and Michelle Obama, by Kehinde Wiley and Amy Sherald; and @taraandjohnny, the sparkle-full joint instagram of Olympic commentators/sparkle experts Tara Lipinski and Johnny Weir. P.S. I’ve gotten some great requests from you guys and am planning to send a lightning round newsletter with answers later this week. Ping me if you have a burning question! P.P.S. New? Old editions live here.